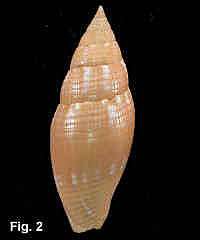 Description: Shell solid, moderately broad with rounded whorls. Early spire whorls with beaded spiral cords, later whorls varying from almost smooth to strongly spirally grooved; 3-6 grooves on penultimate whorl, 4-18 on body whorl, grooves weaker in middle of body whorl. Aperture length half or more of total shell length. Columella with 4-5 sharp plaits. Outer lip interior with small denticles anteriorly in mature shells. Colour fawn to brown, usually ornamented with white spots, blotches or axial streaks. Covered with a thin light brown periostracum when alive. Size: Up to 60 mm in length. Distribution: Endemic to Australia; Capricorn Channel, Queensland to Lakes Entrance, Victoria. 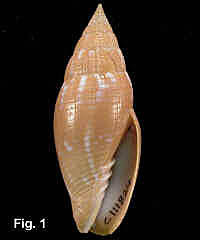 Habitat: Subtidal, 9-133 metres, and uncommonly as a beach shell. Occurs on beaches in Botany Bay, possibly disturbed from the sediments by dredging. Synonym: Vicimitra phosphora Iredale, 1936 is based on a smooth specimen, which is well within the range of variation of the species.